Don’t write Tax Day off completely – it’s a big day for deals and freebies. This year’s tax relief includes free treats, discounted meals and free paper shredding along with a way to eliminate the stress of filing at the last minute – free massages. The bulk of the deductions are only offered on the official day, April 15, but a few deals start early and some extend past Monday. Applebee’s has $1 strawberry margaritas through April 30 at participating locations. Running out of time to do your taxes? Filing for a six-month extension is simple. You finally got your tax refund! Treat yourself and here are the best ways to spend it. BJ’s Restaurant & Brewhouse: Get half-off lare deep dish or Tavern-Cut Pizzas Monday for dine-in, take-out or delivery. April 15 also kicks off three weeks of free delivery and no service fee on delivery orders through the BJ’s website. Learn more at www.bjsrestaurants.com/freedelivery. How to protect yourself from tax scammers and identity fraud. 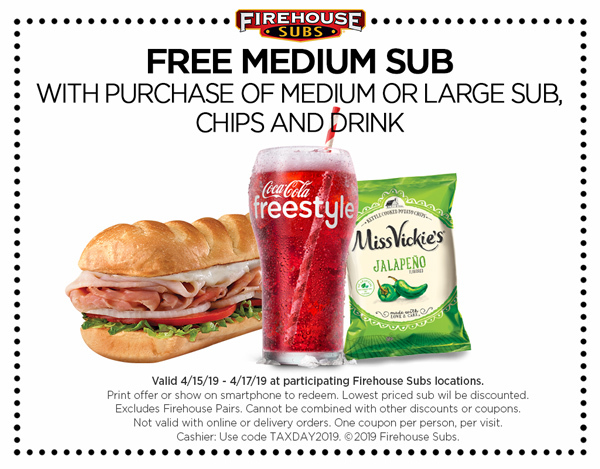 Firehouse Subs: Get a free medium sub with purchase of a full-price medium or large sub, chips and a drink Monday through Wednesday at participating locations with a coupon that can be printed out or shown on a phone. The coupon will also be posted on the restaurant’s social media channels. McDonald’s: Participating restaurants in select locations across the country have Tax Day deals Monday. Check with your closest location. There also are various offers on the fast-food chain’s mobile app including buy one Big Mac, get one for 50 cents. Red Robin: Monday kicks off the chain’s Royalty Appreciation Week and Red Robin Royalty members can get daily deals with a purchase of $10 or more through Sunday, April 21. The Tax Day freebie is a free milkshake. Sign up for the free loyalty program at www.redrobin.com/royalty. Slim Chickens: The chain has a one-day Tax Day promotion with a $5.99 Chick’s Meal, which includes three tenders, two pieces of Texas Toast, a side of your choice and a medium drink. Limit one per person. Smoothie King: Get $2 off any 20-ounce smoothie Monday through Thursday with Smoothie King’s Healthy Rewards app. Learn more at www.smoothieking.com/taxday. These are the top cities where taxpayers tend to get larger refunds. Buzz60’s Sean Dowling has more.